Sony Ericsson Xperia Active latest smartphone by Sony was launched recently at CommunicAsia2011 in Singapore. It is powered by Android 2.3 Gingerbread operating system. This is a special design for active lifestyle and boasted with many facilities and features to match well for every requirement. It has pre-loaded sports apps, which will be a great help for the user to keep a check over fitness levels. Its built-in GPS, Barometer and Compass will result into a great help for this purpose. It has a special feature to have on-screen heart rate and pulse monitor through ANT+ wireless networking technologies. This feature is first of its kind to introduce in the smartphones’ market. It is a complete blend of worry free mobile features, fitness mantras and fun for all. It is a best facility to combine user’s personal and professional needs at one go. It is completely water and dust resistant smartphone. Its multi touch screen is completely scratch resistant and allows wet finger tracking too. Many helpful active life apps credited in this smartphone such as on-screen heart rate monitor and fitness verification. This mart phone available in orange band with black back cover-white extra cover in the kit. White band with black back cover-white extra cover in the kit. Size: 55 x 92 x 16.5mm. This smartphone runs on Google’s Android Gingerbread v2.3 OS. It is powered through 1 GHz powerful processor. It has 3-inches touch screen with Real Display with Mobile Bravia Engine. It has a phone memory of 320MB and this can be increased up to 32GB through micro SD card slot and supplied along with 2GB capacity micro SD card in it. It has 1200mAh capacity battery to offer 4 hours 53 minutes talk time on single recharge. It has Bluetooth, Wi-Fi, USB 2.0 interface, micro SD card slot, built-in GPS, 3,5mmaudio jack in it. It can support 3D games, motion gaming FM radio, video streaming and many more. 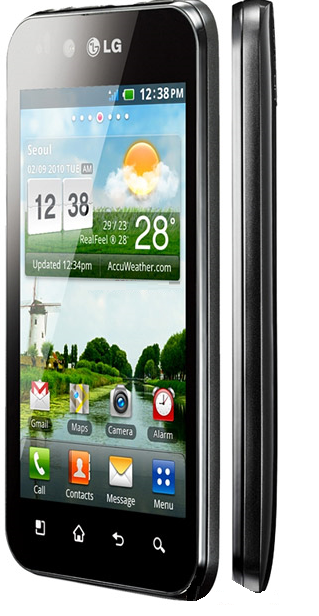 Optimus Black comes with Android 2.2 operating system, 1Ghz processor, 5 MP Camera and also a 2 MP Camera for video calling. It is capable of recording videos up to 720p HD quality. Optimus Black has a 4 Inch Nova IPS Display with 800 x 480 pixels. 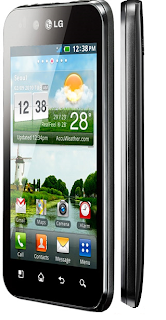 On connectivity front Optimus Black is equipped with 3G, Wi-Fi, A-GPS, Bluetooth and Micro USB. It also has DLNA Connectivity and also supports Dolby Mobile effects. Operating System: The phone is powered by Android 2.2 OS which can be further upgraded to v2.3 version and the phone has a support for hundreds of JAVA applications that can be installed as third party applications. Display: The phone has a 4.0 inch LCD screen that can be used comfortably up to a resolution of 480 x 800 pixels. The phone has a support for 16M colors and with its auto turn-off and touch sensitive controls it is a great work. Memory: The phone supports 2GB internal memory which can be further extended upto 32 GB. For higher processing, P790 has been given a 512 MB RAM too. Camera: LG Optimus Black P970 comes with a 5MP camera that can take pictures up to 2592 x 1944 pixels. The camera comes with auto-focus and geo-tagging features. Further the camera is available with LED flash so one need not to worry about the light conditions. Connectivity: LG Optimus Black P970 has a support for almost all the latest connectivity options including GPRS, EDGE, 3G, WLAN, Bluetooth and USB interface. Processor: The phone has a 1GHz OMAP 3630 processor supported by a 512 MB RAM making it one of the fastest Smart Phones available in the market.